As many of you know, Indiana is home to one of the largest online retailers of Doctor Who and BBC merchandise in the US. In addition, as you might have seen on their #FLSFriday post, they have a fairly new location in Camby! With all of Who North America‘s new space, they are looking to start a new fall tradition. 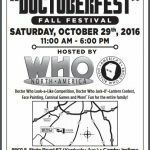 This Saturday, October 29th, they are going to be hosing their first Doctoberfest! 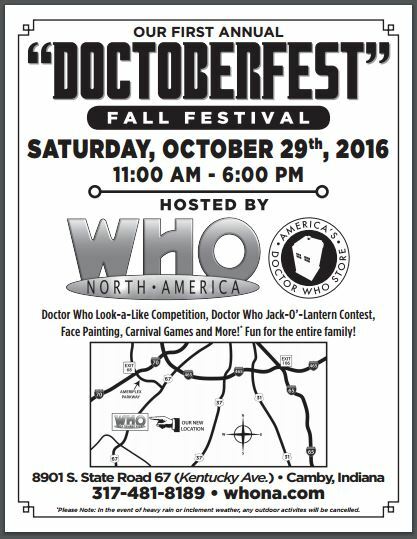 From 11:00 AM to 6:00 PM, they are going to not only have their location open, with all of their cool merchandise, museum, and games, but they are also going to be hosting a Doctor Who Look-a-Like Competition, a Doctor Who Jack-o’-Lantern Contest (Captain Jack-o’-Lantern? ), in addition to vendors, face painting, carnival games, and more! This is a family friendly event, held at their location, and admission is free. AP Collectibles – Aaron carries action figures, as well as high-end collectibles. Great place to shop for items for yourself, or the discerning fan in your life. Time Lord Expo – Representatives of this show outside of Dayton, OH will be on hand to talk about their Doctor Who convention. All the Whos in Whoville – This is a show out of Louisville, KY, that blends Doctor Who with Doctor Seuss. Obscure Links – Chain maille bracelets, necklaces, key chains, and more can be found at this vendor booth. The Five(ish) Fangirls – Rachel from this fannish podcast will be on hand with recording equipment, do to interviews for their podcast. The Art of Kahahuna – Not only does this fantastic artist do great work but she’s also going to have TARDIS Tea, a blend of Ceylon black tea, green rooibos, orange peels, ginger, clove, nutmeg, & cinnamon! I admit to really wanting to try this! Toys for Tots – The Marine Corp. will be setting up a Toys for Tots collection box at the event, for your donations! Geeking in Indiana – Yep! I’ll be sharing table space with The Five(ish) Fangirls Podcast! Not sure what all I’m doing yet, but I’ve got a few days, right? I know there’s a few other people that are in discussions, as well, so this is not, by any means, a final list of attendees and events. Also, this is going to be held outside. Currently, it’s only showing a 10% chance of rain on Saturday, but note that if there is bad weather, they will be cancelling any outdoor activities. Finally, this is the first year this is happening. Who North America is hoping it will become a yearly event, but since no one knows what the crowd is going to be like (currently, there are 289 interested, and 69 going on the Facebook Event Page) it will be interesting to see how the space handles it. Already, there are concerns about parking, so if you have the ability to Uber/Lyft it, or carpool, you’ll probably want to do so! So, here’s the info you need to come have a good time with a bunch of Whovians! How much is it? The event is free, but carnival games will cost money, plus you’ll want to bring money for the vendors. Where can I find information? The Facebook Event Page has been the best place for up-to-date information. Also, if you’re interested in the Look-a-Like Competition, or the Jack-o’-Lantern Competition, email them at whona@whona.com for an entry form!